Don't let the fact that you haven't heard of this sumptuously shot and intelligently written work from The Others mastermind Alejandro Amenabar fool you into expecting the worst. First and foremost, the victim of a forgettably bland title (“Agora” refers to an Ancient Greek gathering place), this multiple award winning Spanish import was done no favors by a foolishly inaccurate advertising strategy. 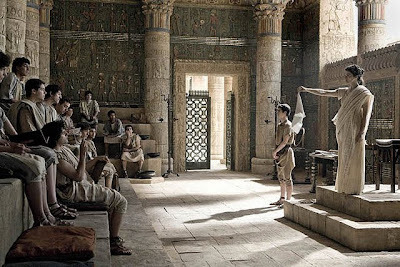 Hoping to play up the sandals and swords on display in Amenabar's old-fashioned Ben-Hur like historical opus by giving action seekers empty promises of a Troy , Alexander or Gladiator angle, Lionsgate ultimately did Agora a disservice. Essentially a bad strategic gamble that underestimated moviegoers, the studio failed to attract those looking for something intellectually – rather than viscerally – thrilling. Amenabar's unusual, admirable work celebrates science, philosophy, deductive reasoning, logic and scholarly pursuit as the purest and most noble weapon to employ against religious fundamentalism fueled violence as Rachel Weisz's brilliant astronomer Hypatia instructs her pupils in matters of equality and the importance of proof over blind faith. Yet instead of letting the facts speak for themselves, those marketing this passionate chronicle of events surrounding the fall of Alexandria in a 4th century holy war, falsely paint Hypatia as some sort of Lara Croft meets Cleopatra construct. Moreover, we're led to believe that “the fate of the ancient world is left in the hands” of Hypatia whom the synopsis claims “becomes the center of an epic battle that changes history forever,” when as a woman, in all actuality and aside from the respect she rightfully earned as part of the Platonic school, Hypatia is merely the one voice of reason in an increasingly unreasonable world ruled by men. Intriguingly as the movie begins, Hypatia's beauty and gender is presented to us like it's almost an accidental afterthought. Mainly, the well-respected astronomy teacher challenges her diverse all-male class of Christians, Jews and Pagans who worship the mythological Gods as well as nonbelievers to weigh the pros and cons of Ptolemy's geocentric model of the universe versus the as yet unproven controversial heliocentric theory. However, while sexual desire is the last thing on the mind of the seemingly asexual Hypatia (despite Weisz's wish that Amenabar would've allowed her to explore her character's femininity a bit further), obviously at least a handful of her pupils are attracted to the oblivious scholar. Her most ardent would-be suitors include the handsome Pagan Orestes (Oscar Isaac) who declares his love for his master in public before she brusquely and matter-of-factly refuses him since to be wed would mean that she would then become a devoted servant and no longer free to expand her mind. No stranger to the contradictions of freedom and servitude, Hypatia's most intense admirer is her loyal slave Davus (Max Minghella). From the first moment Minghella's Davus appears onscreen, we're immediately aware of what's lurking underneath his gaze. And considering the hot, smoldering looks he musters up the courage to send her way, it's no wonder that out of frustration that they're not of equal station, Davus rebels. Enslaved, he becomes a Christian in order to be free and perhaps does so with the aspiration to declare his love as a man worthy of her hand until the tenderness of his affection is tainted with violent anger. Despite his fascinating presence, the character of Davus is fictitious. Likewise, we can't be certain just how accurate the depiction is on the whole regarding what eventually occurred with some of Hypatia's former pupils who turn on her by aligning with the Christians following a deadly holy war that overthrew the Pagans and destroyed the Library of Alexandria. For by eliminating all theories and scientific proofs in the library, the Christian warriors drive home the lesson that in direct contrast with scholarly pursuit, there is only one book to follow. Thus, the underlying message of the danger of fundamentalism in religion of all types remains truer and timelier than ever. And repeatedly, Agora easily and urgently invites us to draw parallels with what is going on in the Middle East today when we see large statues being defaced and toppled to the ground as well as contradictions in religious words and actions here and abroad. Yet as much as we're initially tempted to simply yell “hypocrite” when presented with the often two-faced Christian characters, Amenabar's film is much more complicated in reminding one that even if you believe in something, you shouldn't stop questioning the world around you. While solar system astronomy is the topic that obsessed Hypatia in her pursuit to remind those that we're all so insignificant in the scheme of things and what unites us is stronger than what divides us, Agora also challenges viewers to inquire about the motives, repercussions and authenticity of blind faith. 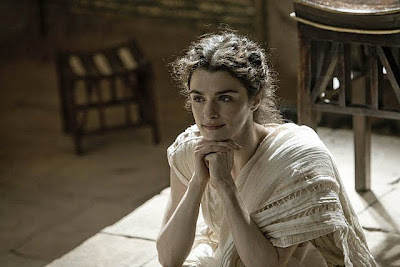 Similar to the way that Hypatia understands that to give herself to a man as a wife, she'll have to put her scholarly days behind her since she will never be able to disobey “her master,” Amenabar draws this subtextual theme out even further by daring us to compare this decision to that of her refusal to convert to religion. Namely, even though her society has been overrun and her fellow Pagans have given in, Hypatia understands that becoming a Christian will mean that she will never be able to question her master God's unexplainable ways since fundamentalist devout faith requires the absence of reason, logic, and absolute knowledge. In stark contrast to the way that Davus sought freedom from literal servitude through Christianity, Hypatia knows that she'll be giving up her freedom for servitude if she joins the religion. For instead of taking up arms, Hypatia takes as many scrolls as she can out of the library, understanding that only the truth can set her free and that can't be found by following just one line of thinking. An unparalleled discovery considering most limited-run Lionsgate discs, it's a brilliant, provocative film about matter over mettle (or even metal). 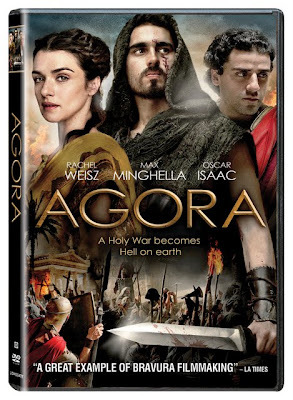 And while Agora does lose focus a bit as it continues on considering the amount of characters and a little suspension of gender-blind disbelief with regard to Hypatia post-holy war, the lengthy yet ambitious new approach to an old fashioned epic makes Agora well worth putting enough faith into to make up your own mind.